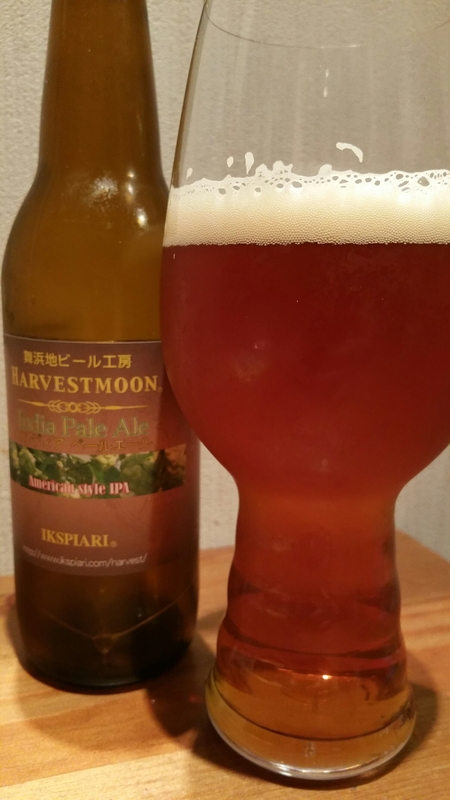 Harvestmoon IPA is a 6% American IPA from Harvestmoon Brewery, based in Chiba, Japan. It’s part of the autumn seasonal line up, and can be found in both bottles and on tap at the time of writing. It’s brewed with three different kinds of imported American hops; however, the most confusing thing about it is that Harvestmoon advertise it as having won silver medal in 2005 in the International Beer Competition for Best English Pale Ale. Let that sink in for a minute and everything else coming up will make sense. Who knows what this is, but it’s a mess. Harvestmoon IPA poured out a hazy copper brown colour with a slight off-white head with flecks of brown in. The head didn’t last long, collapsing in on itself, leaving a thin oily ring around the edge of the glass. But what the heck happened to the aromas?! A sweet, soapy aroma that resembled washing up liquid permeated through with some weird fruity plum like aroma. I know I had washed the glass beforehand, and then rinsed it, but this aroma wasn’t even the worst thing about Harvestmoon IPA. The body… that had to be the worst thing about it. Harvestmoon IPA had some disgusting tangerine washing-up liquid flavour to it (before you comment “oh, he didn’t wash the glass properly”, trust me, my washing up liquid tastes like lemons, but that’s a story for another time.) It had a sticky taste to it with a malty caramel flavour to it – why this has been advertised as an American IPA when it’s nothing like one is beyond me. There wasn’t even a discernible level of bitterness to it either. It’s certainly not bland by any means, but it’s not tasty either. I ended up pouring Harvestmoon IPA away as it was just disgusting. I hope that this bottle of Harvestmoon IPA was a one-off, else it’s disgusting and I would avoid it.